[S6] Mc Intire, Annapolis Maryland Families, L.D.S. Library, 975.256 D2w. [S18] Hitory of Fayette County KY. Unknown cd. [S21] National Geneological Quarterly 18-20. [S26] William John Hinke, Pennsylvania German Pioneers, Vol. 1. 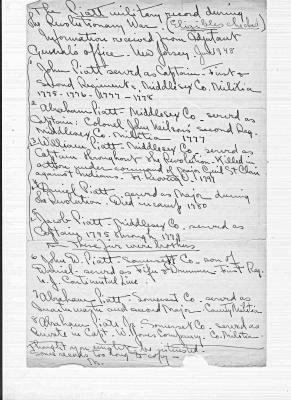 [S40] Lineage application of Sallie Scott Richardson, MVW file, DAR, This application was handwritten by Sallie Scott Richardson and then was transcribed by Stephens L. Blakely. [S82] Annie Walker Burns., Revolutionary War Pensioners of Fayette Co.
[S110] Unknown subject, unknown repository, unknown repository address. [S111] Unknown subject, unknown repository, unknown repository address. [S129] Unknown subject, unknown repository, unknown repository address. [S178] Unknown subject, unknown repository, unknown repository address. [S212] Unknown subject, unknown repository, unknown repository address. [S280] Unknown subject, unknown repository, unknown repository address. [S281] Unknown subject, unknown repository, unknown repository address. [S283] Unknown subject, unknown repository, unknown repository address. [S301] Unknown subject, unknown repository, unknown repository address. [S321] Unknown subject, MVW file, 100 Beach Dr. # 1801, St. Petersburg, Pinellas County, FL. [S324] Unknown subject, unknown repository, unknown repository address. [S327] Unknown subject, MVW file, 100 Beach Dr. # 1801, St. Petersburg, Pinellas County, FL. [S355] Unknown subject, unknown repository, unknown repository address. [S381] Unknown subject, unknown repository, unknown repository address. [S385] Unknown subject, unknown repository, unknown repository address. [S386] Unknown subject, unknown repository, unknown repository address. [S387] Unknown subject, unknown repository, unknown repository address. [S391] Unknown subject, unknown repository, unknown repository address. [S399] Unknown subject, unknown repository, unknown repository address. [S406] Unknown subject, unknown repository, unknown repository address. [S411] Unknown subject, unknown repository, unknown repository address. [S412] Unknown subject, unknown repository, unknown repository address. [S419] Unknown subject, unknown repository, unknown repository address. [S421] Unknown subject, unknown repository, unknown repository address. [S422] Unknown subject, unknown repository, unknown repository address. [S424] Unknown subject, unknown repository, unknown repository address. [S426] Vollmer, Emmigration Application, March 1857, MVW file, 100 Beach Dr. # 1801, St. Petersburg, Pinellas County, FL. [S429] Unknown subject, unknown repository, unknown repository address. [S431] Unknown subject, unknown repository, unknown repository address. [S432] Unknown subject, unknown repository, unknown repository address. [S434] Unknown subject, unknown repository, unknown repository address. [S441] Unknown subject, unknown repository, unknown repository address. [S458] Lois E. Hughes, compiler, Wills Filed in Probate Court Hamilton County, Ohio (n.p. : Heritage Books, Inc.). 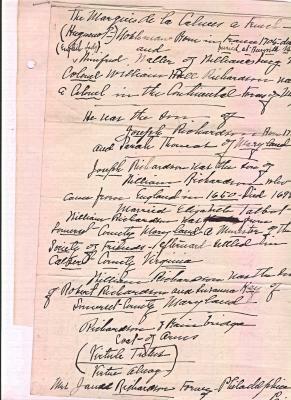 Hereinafter cited as Hamilton County Wills. [S459] Lea L. & Silvestri, Patti L. Dowd, Early Basses in Virginia including Captain Nathaniel Basse (Portsmouth, VA: Privately published, 1999). Hereinafter cited as Early Basses in Virginia. [S506] MC Intire, Annapolis Maryland Families (n.p. : n.pub., unknown publish date). 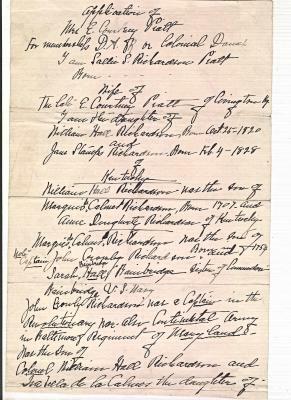 Hereinafter cited as Annapolis Families. [S532] D.A.R, compiler, Official Roster of Soldiers of the Revolution Buried in Ohio (n.p. : n.pub., 1929. Hereinafter cited as Ohio Rev Soldiers. [S582] Susan Tillman, "Susan Tillman - Piatt Correspondence," e-mail message from Susan Tillman [mailto:e-mail address] (unknown address) to MVW, Oct 2005. Hereinafter cited as "Susan Tillman." [S583] Letter from Martha Eugenia DeValcourt Piatt Lockwood (Cincinnati, Ohio) to Margaret James Blakely, July 15 1951; MVW file (100 Beach Dr. # 1801, St. Petersburg, Pinellas County, FL). Martha Lockwood was married to Schuyler Lockwood. Evidently Peggy J. Blakely asked her about eligibility in the Society of the Cincinnati. This letter is her response detailing the various Piatt brother's service. [S609] Edwin Porter Thompson, History of the First Kentucky Brigade (Cincinnatti, Ohio: Caxton Publishing House, 1868). Hereinafter cited as First Kentucky. [S630] Unknown record type: John Smith, by unknown photographer; unknown series; unknown repository, unknown repository address. Online unknown url; unknown file name.